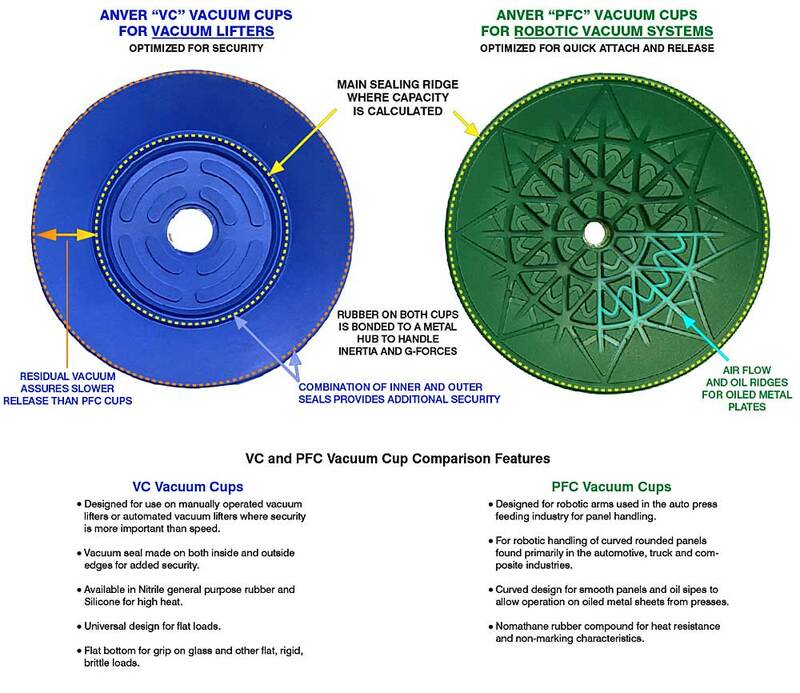 PC Cups vs. VC Cups. 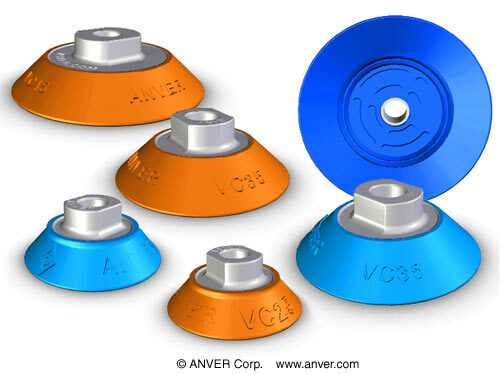 Production quality construction with a universal design make ANVER VC Series Vacuum Cups suitable for most applications. 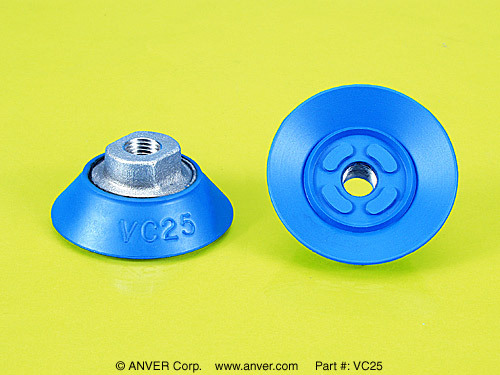 Thick rubber bonded to a machined aluminum base make these vacuum cups rugged and long lasting. 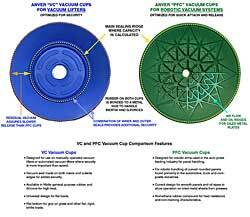 VC Vacuum Cups are well suited for high duty use found in the automotive industry and in press feeding operations. Rugged construction design with deep threaded mounting hole for use in heavy production. Long low-angle lip requires little pressure to make initial contact. This flexibility also compensates for inaccuracies in cup height. Two inside sealing edges make contact after vacuum is attained and become the main sealing edges for safety. Strengthened outside lip helps achieve a fast, even release. 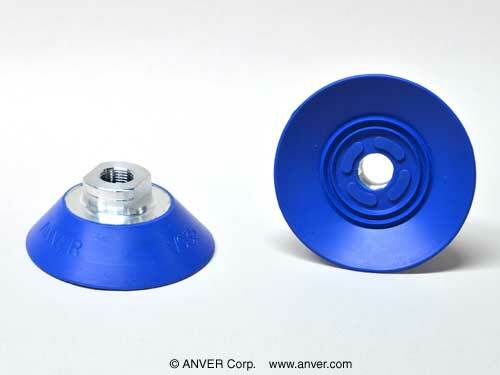 Durable, soft rubber bonded to a stiff aluminum hub gives these vacuum cups an excellent non-skid grip. Cleated bottom makes these vacuum cups excellent for both horizontal and vertical loads. Suspension Assemblies are available in a variety of styles and sizes. Light gauge sheet and other thin materials to thick blocks. Slightly textured surfaces, such as fiberglass panels, plastic, auto panels, auto glass, etc. The standard material is Blue Nitrile and Red Silicone. * The cup capacities shown above are based on 24″Hg at sea level with a safety factor of two (2) in the horizontal (flat), and four (4) in the vertical (upright). Vertical Load Capacity is half of the listed Horizontal Load Capacities above.